Let me ask you a question. What’s the only thing better than a cookie? How about a cookie with a cookie inside of it? 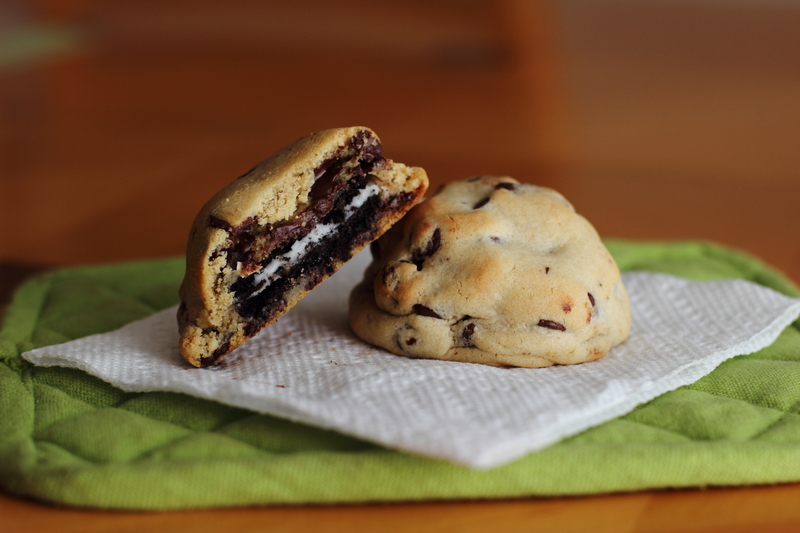 Yes, I’m talking about the famed Oreo-stuffed chocolate chip cookies! I’ve seen these cookies on Pinterest and all around the internet. Now, when I first saw them, I was skeptical about putting a fully baked cookie within a cookie. That was before I tried double chocolate chunk Oreo cookies, though. That completely cured me of my doubt about the magic of baking Oreos into cookies. After trying those, I couldn’t wait to tackle the full-fledged Oreo-stuffed chocolate chip cookies! Now, what can I say about these cookies? They’re delicious. They’re gigantic (I’m talking in between a golf ball and a tennis ball), and they are fun to eat! The Oreo-stuffed cookies are also really pretty when you bite into them, and they make people’s eyes pop when you tell them that there is a whole Oreo inside of there. Fun! Posted on October 6, 2013 by rjoy19	• This entry was posted in Chocolate, Chocolate, Cookies, Cookies, Recipes, Uncategorized and tagged Chocolate Chip Cookies, Oreo-Stuffed Cookies. Bookmark the permalink.